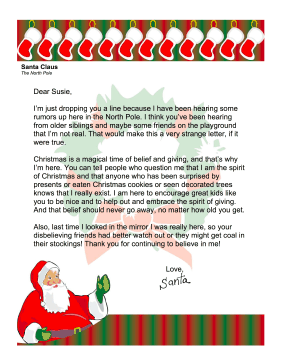 Meant for a child who has started to hear rumors about Santa Claus, this free, printable Christmas letter discourages disbelief and maintains Santa's existence. I'm just dropping you a line because I have been hearing some rumors up here in the North Pole. I think you've been hearing from older siblings and maybe some friends on the playground that I'm not real. That would make this a very strange letter, if it were true. Christmas is a magical time of belief and giving, and that's why I'm here. You can tell people who question me that I am the spirit of Christmas and that anyone who has been surprised by presents or eaten Christmas cookies or seen decorated trees knows that I really exist. I am here to encourage great kids like you to be nice and to help out and embrace the spirit of giving. And that belief should never go away, no matter how old you get. Also, last time I looked in the mirror I was really here, so your disbelieving friends had better watch out or they might get coal in their stockings! Thank you for continuing to believe in me!